Josh Milan debuts both his solo LP and a brand new book - selling out fast! Honeycomb Music is extremely honored to present the highly-anticipated debut LP from producer and musician extraordinaire Josh Milan. Not only is Josh the CEO of Honeycomb Music, bringing you such hits as "Your Body," "I Will Wait" and much more, he has spent over 3 years producing and developing this exquisite 24-song collection. A nod to his day of birth, "6.9.69" represents Josh's musical journey, fusing influences from some of the giants of music (i.e., Quincy Jones, Pat Matheny et al.) and creating an incredibly crafted debut LP. Josh's lyrics explore topics of politics, identity, race, relationships and love while his music explores his life-long love of live music. This album is simply inspiring and innovative on every level. Even to describe his work in these terms understates the magic that Josh Milan brings to his debut. "6.9.69" is the kind of album you play all the way through without stopping - a masterful masterpiece! 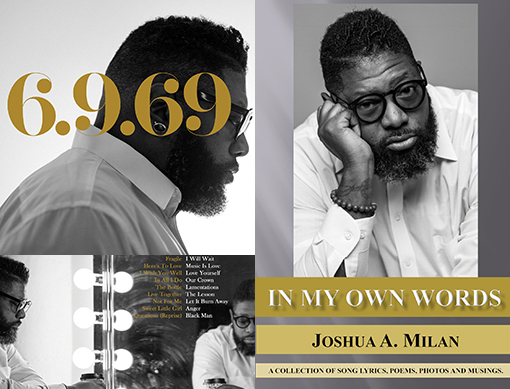 For his own book, Josh MIlan pens this fantastic book of lyrics, thoughts and musings. "In My Own Words" includes lyrics from such timeless gems as: I Will Wait, Confession, Children of the World and more. Cover and CD art design by Adam Cruz.